Bariatric Vitamins that Care about Your Health! Post bariatric surgery patients can enjoy eating out. 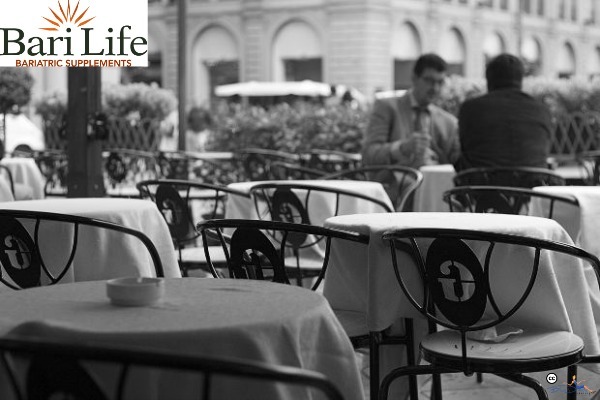 Bari Life Bariatric Vitamins and Supplements knows that for most people eating out is a common everyday occurrence and has become as much of a social outing as a convenience in our busy society. Post bariatric surgery patients often struggle with how to balance socializing with family and friends while still following a healthy diet. After surgery it is important to make sure you are tolerating solid foods well before heading out to your favorite restaurant. With a little planning and thoughtful ordering, it is very possible to eat out and maintain your post bariatric surgery meal plan. Plan Plan Plan! Most restaurants have menus online and some even have a healthy meal section. Make sure you plan where to eat, check their online menu and decide on a few healthy options. Don’t skip meals or snacks before going to a restaurant as you do not want to be excessively hungry and risk overeating and making poor food choices. Skip the bread or chips and even request that neither is brought to the table pre-meal. Don’t order a beverage and, if water is brought to your table, put it aside to avoid reaching for a sip out of habit. Order a balanced meal that includes a lean protein, starch and vegetables. Remember protein is your priority. Choose foods with lower fat options including baked, braised, broiled, grilled, poached, roasted, and steamed. Avoid any foods that are batter-fried, pan-fried, buttered, creamed, crispy, and breaded. Make special requests. Most restaurants are happy to accommodate any special diet needs. If you decide on a sandwich, choose lean roast beef, ham, turkey or chicken on whole grain bread. Ask for condiments such as mustard, ketchup, salsa or low fat spread, on the side. Consider ordering an appetizer for your main meal as it generally is a smaller portion. Remember to choose the lower fat options (see above). Request a to-go box when ordering your meal so that you can immediately portion off your appropriate serving size before you eat and put the rest in the box to take home. Eat slowly, take small bites, and thoroughly chew your food. Dining out has become a way of life for most Americans. It is as much a time to get together and socialize with friends as it is a time to eat. As a post bariatric surgery patient, you must make sure to continue your healthy eating habits. By planning ahead and making conscientious food choices, you will be able to enjoy eating out with family and friends and maintain your new healthy living style.